It's finally here. The big dumping of snow that's been forecast all week. So what is there to do?!! 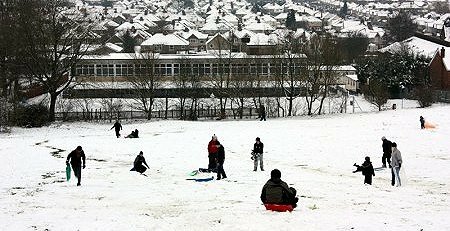 We haven't had a big snowfall since 2013, so now's a rare chance to go sledging, skiing and snowboarding in Swindon - most probably all week! And here's the best places! Just remember to take care if you're enjoying the snow and sliding near barbed wire fences! 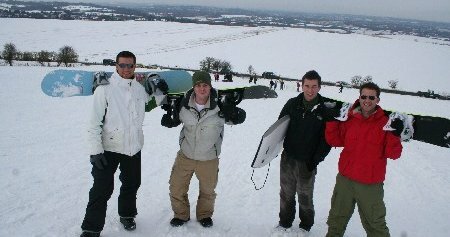 One of the best and slippiest slopes in Swindon - and just steep enough for everyone to have to go. One of our favourites - see vid link below. Two slopes available - both great for picking up speed! The steepest and longest hill of the lot. Best for skiing and snowboarding. Can be tricky to get to if the snow really starts coming down, though! Always a popular spot when the snow starts falling - and wide enough for everyone. Just off the A4361 Devizes Road. 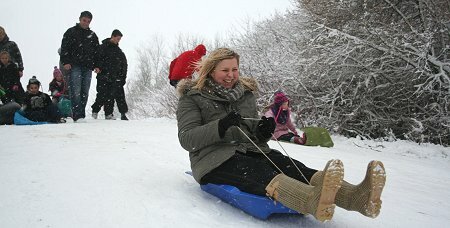 And if you haven't got a sled? Try these people first. If they haven't got one, chances are no one has! Snow Joke On The Swindon Roads! Crikey, it's freezing! And snow's on its way too. Got your hats, boots, long johns? - we're on it! Come and give Danny a hand!